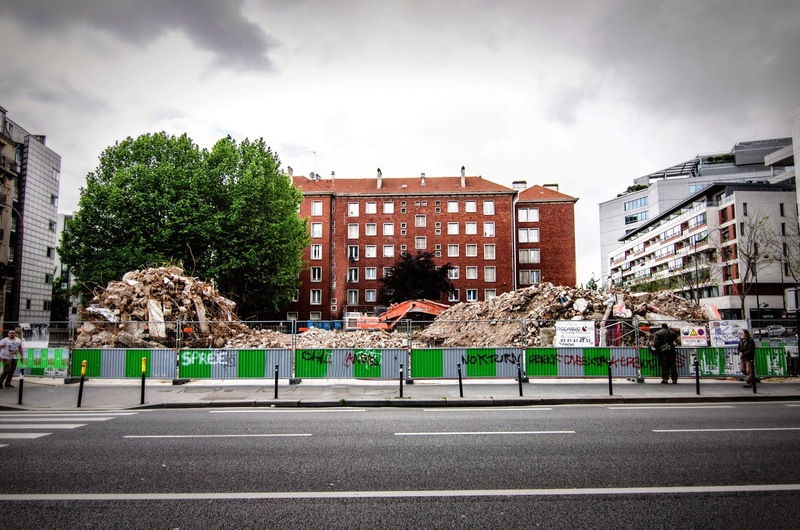 ParisDailyPhoto: Ashes to ashes, concrete to dust! Everything comes to an end in this world, especially old and ugly buildings, even if the once sheltered art... For yes, ladies and gentleman, this is where I took this photo, and this photo, after I initially took this one... I guess you know what I'm talking about now, don't you?! Update: thanks to Flore, a true visitor to PDP, here is a link to the "live" feed of the demolition. Oh yes I do. It is a real pity for all the artistic work that was sheltered inside the Tour 13. I saw the video of the destruction on internet. I figured, from the title, that might be the case. So, they finally took it down. It's a shame...it generated such creativity! I knew it immediately. It's become like an old friend to PDP fans. Thank you Eric ! True, I am... yes ! And happy to be !! Too bad, but at least it went out in a blaze of artistic glory. Now, are there any other buildings due for demolition? Too bad. But thanks to you (and Flore) for the video. It looked like the machines were eating the building (and I loved how you could tell when they were having their lunch break).